WASHINGTON, Sep 5, 2011 (IPS) – When David Petraeus walks into the Central Intelligence Agency Tuesday, he will be taking over an organisation whose mission has changed in recent years from gathering and analysing intelligence to waging military campaigns through drone strikes in Pakistan, as well as in Yemen and Somalia. But the transformation of the CIA did not simply follow the expansion of the drone war in Pakistan to its present level. CIA Director Michael Hayden lobbied hard for that expansion at a time when drone strikes seemed like a failed experiment. 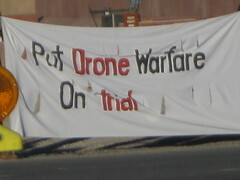 ISLAMABAD, Aug 16, 2011 (IPS) – Pakistani civilian and military leaders are insisting on an effective veto over which targets U.S. drone strikes hit, according to well-informed Pakistani military sources here. Recent developments (including the aerial bombardments of Pakistani villages under the auspices of the “war on terrorism”) indelibly point to a broadening of the Afghan war theater, which now encompasses parts of Pakistan. The underlying tendency is towards an Afghan-Pakistani war. “Nascent democratic reforms will produce little change in the face of opposition from an entrenched political elite and radical Islamic parties. In a climate of continuing domestic turmoil, the Central government’s control probably will be reduced to the Punjabi heartland and the economic hub of Karachi,” the former diplomat quoted the NIC-CIA report as saying. Continuity, characterized by the dominant role of the Pakistani military and intelligence has been scrapped in favor of political breakup and balkanization. According to the NIC-CIA scenario, which Washington intends to carry out: “Pakistan will not recover easily from decades of political and economic mismanagement, divisive policies, lawlessness, corruption and ethnic friction,” (Ibid) . This US agenda for Pakistan is similar to that applied throughout the broader Middle East Central Asian region. US strategy, supported by covert intelligence operations, consists in triggering ethnic and religious strife, abetting and financing secessionist movements while also weakening the institutions of the central government. The broader objective is to fracture the Nation State and redraw the borders of Iraq, Iran, Syria, Afghanistan and Pakistan. Ambassador Husain Haqqani will discuss the current situation in Pakistan. Produced for Link TV by Jamal Dajani. Leaders of the two largest parties in government met over the weekend to finalize what those charges will be. The killing of 11 Pakistani soldiers by U.S. air and artillery strikes last week shows just how quickly the American-led war in Afghanistan is spreading into neighbouring Pakistan. Pakistan’s military branded the air attack “unprovoked and cowardly.” There was outrage across Pakistan. However, the unstable government in Islamabad, which depends on large infusions of U.S. aid, later softened its protests. Attacks by U.S. aircraft, Predator hunter-killer drones, U.S. Special Forces and CIA teams have been rising steadily inside Pakistan’s autonomous Pashtun tribal area known by the acronym, FATA. The Pashtun, who make up half Afghanistan’s population and 15% of Pakistan’s, straddle the border, which they reject as a leftover of Imperial Britain’s divide and rule policies. Instead of intimidating the pro-Taliban Pakistani Pashtun, U.S. air and artillery strikes have ignited a firestorm of anti-western fury among FATA’s warlike tribesmen and increased their support for the Taliban. The U.S. is emulating Britain’s colonial divide and rule tactics by offering up to $500,000 to local Pashtun tribal leaders to get them to fight pro-Taliban elements, causing more chaos in the already turbulent region, and stoking tribal rivalries. The U.S. is using this same tactic in Iraq and Afghanistan. This week’s deadly U.S. attacks again illustrate the fact that the 60,000 U.S. and NATO ground troops in Afghanistan are incapable of holding off the Taliban and its allies, even though the Afghan resistance has nothing but small arms to battle the West’s hi-tech arsenal. U.S. air power is almost always called in when there are clashes. In fact, the main function for U.S. and NATO infantries is to draw the Taliban into battle so the Afghan “mujahidin” can be bombed from the air. Without 24/7 U.S. airpower, which can respond in minutes, western forces in Afghanistan would be quickly isolated, cut off from supplies, and defeated. But these air strikes, as we saw this week, are blunt instruments in spite of all the remarkable skill of the U.S. Air Force and Navy pilots. They kill more civilians than Taliban fighters. Mighty U.S. B-1 bombers are not going to win the hearts and minds of Afghans. Each bombed village and massacred caravan wins new recruits to the Taliban and its allies. The U.S. and its allies are edging into open warfare against Pakistan. The western occupation army in Afghanistan is unable to defeat Taliban fighters due to its lack of combat troops. The outgoing supreme commander, U.S. Gen. Dan McNeill, recently admitted he would need 400,000 soldiers to pacify Afghanistan. Unable to win in Afghanistan, the frustrated western powers are turning on Pakistan, a nation of 165 million. Pakistanis are bitterly opposed to the U.S.-led war in Afghanistan and their nation’s subjugation to U.S. policy under dictator Musharraf. “We just need to occupy Pakistan’s tribal territory,” insists the Pentagon, “to stop its Pashtun tribes from supporting and sheltering Taliban.” But a U.S.-led invasion of FATA simply will push pro-Taliban Pashtun militants deeper into Pakistan’s Northwest Frontier province, drawing western troops ever deeper into Pakistan. Already overextended, western forces will be stretched even thinner and clashes with Pakistan’s tough regular army may be inevitable. Widening the Afghan War into Pakistan is military stupidity on a grand scale, and political madness. But Washington and its obedient allies seem hell-bent on charging into a wider regional war that no number of heavy bombers will win. There has been a historic shift in Pakistan that is largely overlooked in the U.S. – a struggle for democracy, led by lawyers. In the U.S., the lack of news coverage has created a distorted view of Pakistan’s President Musharraf and of the Pakistani people. The United States’ support of Musharraf, widely considered a dictator, has generated anger at America in Pakistan’s middle class. Bombs in Lahore reveal the depth of the challenge facing Pakistan’s new government. Beena Sarwar is a journalist in Pakistan, former Editor ‘The News on Sunday’ and Nieman Fellow at Harvard University. She is currently based in Karachi. Pakistan’s national elections today are critically important for this strife-torn country’s future. They are almost as crucial for its western backers. Unless honestly conducted – and this seems highly unlikely – the vote will ignite further violence, plunging the highly strategic nation of 163 million into new dangers. As of this posting, the turnout is disappointingly low, averaging less than 35%, caused by apathy, political fatigue, fears of attacks and the widespread belief that the elections will be manipulated by the government of President Pervez Mushattaf. Only one thing is certain about today’s vote. If President Pervez Musharraf and his PML-Q party do well enough to retain power or head a coalition, the election was likely rigged. Musharraf has rigged every vote since seizing power in a 1999 military coup. Polls show only 15-20% of Pakistanis support him. The majority backs the late Benazir Bhutto’s People’s Party, and former prime minister Nawaz Sharif’s Muslim League (PML-N). A coalition of Muslim parties, and cricket star Imran Khan’s PTI, may also garner some new voters, though Islamists have been trailing in the polls. While piously claiming to be waging war in Afghanistan to bring it democracy, the western powers have been encouraging and abetting dictatorship in Pakistan. The reason is clear: Musharraf has rented out much of his army and intelligence service to battle Taliban in Afghanistan and tribal militants at home. His fee: up to $1 billion monthly in secret and overt US payments. Without them, Musharraf wouldn’t last very long. Musharraf and his US and British patrons are hoping the opposition will split the vote and become deadlocked, leaving the former general as last man standing. The opposition, by contrast, is talking about ending the war against Taliban and reasserting Pakistan’s interests in Afghanistan and Kashmir – something Washington and London do not want to hear. The powerful military still supports Musharraf, though for how long depends on the level of post-election violence. Gen. Ashfaq Kiyani, the new armed forces chief, was selected by Musharraf and Washington as a loyal anti-Islamist who would follow America’s lead. But this capable general remains an enigma. Indian intelligence sources say the US decided in early 2007 to ease the floundering Musharraf from power and make Gen. Kiyani Pakistan’s new strongman. One is reminded of Henry Kissinger’s cynical quip that the only thing more dangerous than being America’s enemy is being its ally. Musharraf’s usefulness to Washington is rapidly nearing its expiry date. If Pakistan is rent by widespread protests and violence over brazen electoral fraud, or suffers political deadlock, the military may overthrow the widely detested Musharraf and seize power. Gen. Kiyani is said to be reluctant to see the military re-engage in politics, but there could be no alternative if veteran politicians Nawaz Sharif and Benazir Bhutto’s widower, Asif Ali Zardari, cannot produce a viable government. The best outcome would be for the military to exile Musharraf and impose temporary martial law until the independent judiciary can be restored, the electoral commission made fair, media ungagged, and political repression ended. Then genuine, honest elections could be held and Pakistan returned to parliamentary government. But once the soldiers taste power again, they may be reluctant to give it up. Until Pakistan gets a legitimate government representing its national interests, rather than those of the western powers, the country will remain in turmoil, and Pakistanis disgusted by the political process. This, in turn, will pour fuel on the rising flames of anti-Americanism and extremism. Pakistan is facing spreading civil war, and possible secession by two of its four provinces. The Pashtun tribal uprising ignited by the US/NATO occupation of Afghanistan is now spreading into Pakistan, risking a full-scale uprising by that nation’s 25 million Pashtuns. Any of these earthquakes could provoke an invasion by India, met by a nuclear riposte from Pakistan. The war in Afghanistan and heavy-handed efforts by the US to bend Pakistan’s military regime to its will ignited much of the current turmoil. A majority of Pakistanis don’t want their soldiers to be western mercenaries, or their leaders to appear western yes-men. They support Taliban, and the struggle for Kashmir. But the US is so consumed by its war of revenge against Taliban over 9/11 – in which Taliban as not involved – it cannot see any of this. Pakistan is the Muslim World’s most important nation and sole nuclear power. By treating Pakistan like a banana republic, arm-twisting Islamabad into battling its own people, and ignoring its own national interests, the US is playing with fire and damaging its own long-term strategic interests. In the first part of this Pakistan elections special, Sir David Frost talks to Asif Ali Zardari, the husband of the late Benazir Bhutto and the co-chair of the Pakistan People’s Party, who says Musharraf would not stand a chance in fair and transparent elections. In part two of this Pakistan election special, Sir David Frost talks to Nawaz Sharif, the former two-time Pakistani prime minister who leads the Pakistan Muslim League. Sharif says Monday’s polls are likely to be rigged as Musharraf lacks grass-roots support. In part three of this Pakistan election special, Sir David Frost talks to Shaukat Aziz, a former Pakistani prime minister, who says Pervez Musharraf is the right person to bring together the country’s different political forces. In part four of this Pakistan election special, Sir David Frost talks to Imran Khan, the founder of the Movement for Justice party, who warns that a Musharraf election victory could lead to unrest even more severe than that following elections in Kenya.